Good news, mobile marketing teams: user retention doesn’t have to be a losing battle. There was once a time when growth was the name of the game in mobile marketing, but the tides are turning. Installs alone are not enough to propel apps to the top of the app store’s search results—mobile engagement and retention are becoming make-or-break metrics for app store optimization (ASO). According to Nielsen, 84% of users’ time on smartphone apps is spent on five non-native apps from the app store. But with increased competition among mobile apps across the board, marketers can’t depend on installs and ratings to push them to the top. It can be hard to acquire users purely by virtue of being the biggest and the best in the category, so app publishers have turned to retention instead. These days, the dark reality of app retention isn’t much of a secret, but it’s important nonetheless. The average retention rates might seem discouraging, but bear with me—there’s a surefire way to improve your metrics in the long run. According to Appboy, less than 25% of people return to an app the day after initial install. Leanplum’s data science report on retention backs this up, revealing that almost 80% of your hard-earned users will leave your app after the first day. By day 90, our findings show that retention drops to 1.89%. The average cost-per-install (CPI) in the US is only $2, but these retention figures put that stat in a new light. To put these numbers in context, consider the TV show Silicon Valley. There’s a scene where the characters remark that their app has 500,000 downloads but only 19,000 daily average users (DAUs). This gives them a 3.8% retention rate, which is above average. Yet, at a $2 CPI, the team would have spent $1MM on retention—$962,000 of which would be lost on users who never returned. For a mobile team planning a large-scale acquisition campaign, these stats are scary. But it’s never too late to invest in a retention strategy to complement your user acquisition. Another mobile marketing secret? Push notifications have a huge impact on retention. Marketing Land reports that sending push notifications (both personalized and generic) boosts 90-day retention by 180%, and eMarketer compiled studies that found more than a 250% increase in retention over the same period. The specific numbers vary from sample pool to sample pool, but the trend remains the same: push notifications improve retention, and personalized push takes it one step further. In Leanplum’s retention report, we found similar figures that emphasize impact of push notifications. The simple act of sending push notifications was shown to increase user retention by 20%, while personalized push showed an astonishing 7x increase. What do personalized push notifications entail? Personalization can include anything from message content to behavioral send triggers. In this case, we found that personalized send times provided the biggest boost to retention. However, you might want to test different factors for your target users. Sometimes, the best way to retain users is to not lose them in the first place. Maintaining high engagement throughout the mobile customer lifecycle makes for a great retention strategy. Many retention strategies focus on pulling dormant users back into the app. It’s easy to forget that keeping users engaged from day one is just as important to your overall retention. 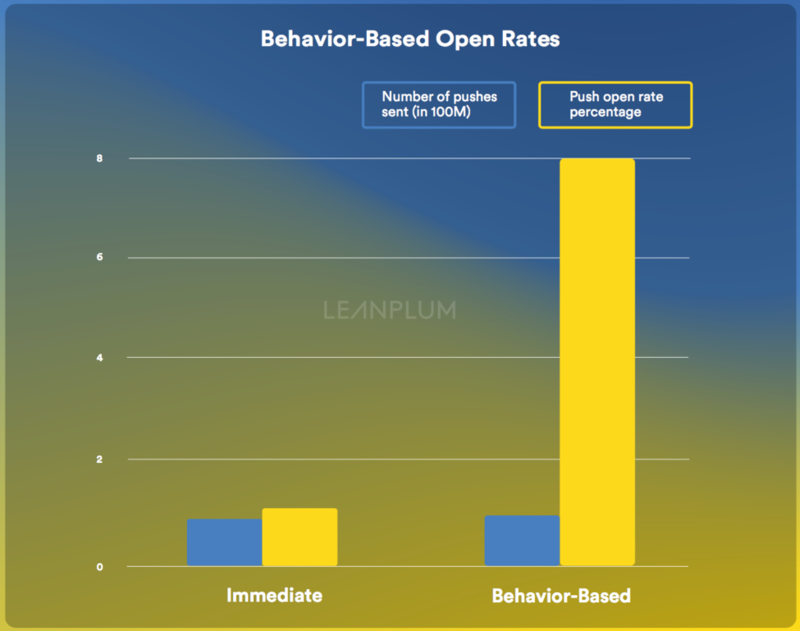 In a Leanplum report on push notification personalization, we found that messages sent by behavioral triggers enjoy an 800% higher open rate than their non-personalized counterparts. 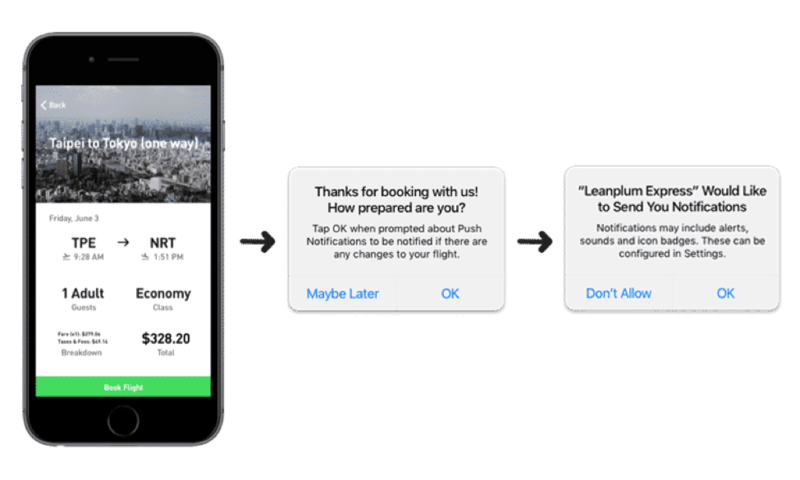 In-app features like a helpful onboarding flow will give users a good first impression, and behavioral push notifications will keep them engaged as they discover more of your app. Even a daily user would benefit from a helpful media recommendation, travel alert, or product discount based on their in-app behavior. After all this talk about the importance of push notifications, let’s not forget that many users never see them. iOS users must opt-in before receiving push notifications, and the average opt-in rate is only 41%. That means over half of your iOS users will be difficult to reach if they fall dormant. To combat this issue, consider optimizing your push notification opt-in request. We’ve found that requesting push permissions up front leads to poor opt-in rates—the request gets lost among the other system permissions prompts, and the user often doesn’t trust the app yet. A more effective alternative is to wait until your app has demonstrated its value before asking for permission. Then, request push notification privileges with a customized in-app message. If the person still declines the prompt, there’s no harm in waiting until another engagement milestone before making the request again. For example, after a user books a trip, the travel app Last Minute Travel uses push pre-permissions to display a customized permission request before displaying the system prompt. This feature earned them a 182% increase in push notification opt-ins. With these four secrets in mind, any mobile marketer can build out a solid retention strategy. There’s a trend here: customized opt-in requests perform better than generic system prompts, behaviorally-triggered push notifications have a higher open rate, and personalized messages help increase retention. When you add it all up, it’s clear that personalization is essential. The overarching secret to retention is that people want personal, meaningful interactions—they’ll be sticking around and coming back for more if that’s what you offer. Have you ventured into the world of mobile apps? Get in touch with our experts HERE!